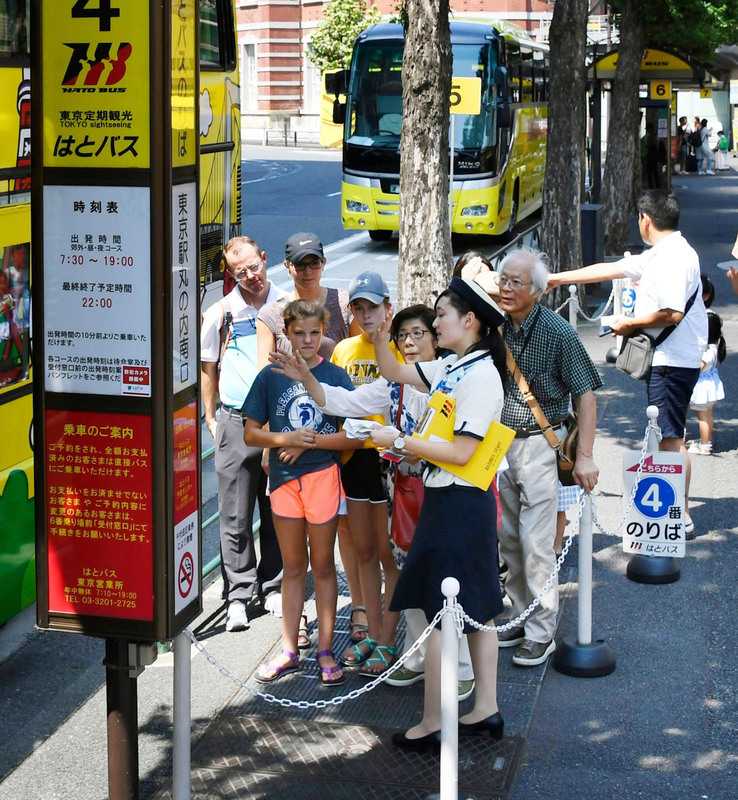 Tokyo bus tour operator Hato Bus Co. celebrated its 70th anniversary Tuesday, with its unique jaunts around the capital continuing to attract many visitors from around the country and also from overseas. Known for its bright yellow buses marked with its logo of a dove, or hato in Japanese, the company has long offered a variety of routes, ranging from conventional tours of famous tourist spots, including Tokyo Tower and the Asakusa area, to a more quirky night tour of Japanese bars with male companions, known as host clubs, in the Shinjuku area. 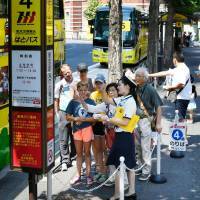 The Tokyo sightseeing tours have so far attracted more than 50 million people. “Even in places that people usually just pass, there are new things to discover if you visit with tour guides,” said a Hato Bus official. The predecessor of the company was established in 1948 when Tokyo was rebuilding after World War II. It started regular sightseeing tours with a mere five tour guides in 1949, and the business has dramatically evolved over the following decades. 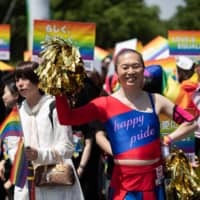 Now with about 160 guides, the company attracted some 890,000 people to its Tokyo sightseeing tours in the year through June and is now gearing up for the Tokyo Games to be held in 2020. 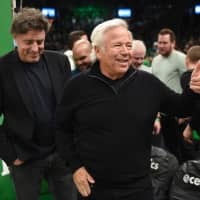 “There is no doubt (the Olympics) will be a big opportunity and we hope to receive a boost from it,” the official said. Helped by the previous Tokyo Olympics in 1964, the company’s Tokyo sightseeing tour business reached its height when it drew about 1.23 million people the following year, with many going on tours covering the venues used in the games. It introduced its trademark yellow buses in 1979 to attract people’s attention, but the business deteriorated and remained low in the 1990s following the burst of Japan’s economic bubble. The number of tourists for its Tokyo sightseeing tours stood at about 520,000 in 2001. 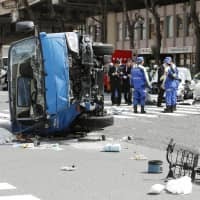 It was not until 2013 that the tours regained popularity, thanks to the opening of the Tokyo Skytree tower and other tourist spots, and the number of tourists taking the tours eclipsed 900,000 for the first time in 20 years. With the National Museum of Western Art designated a UNESCO World Heritage site in 2016 and the Ginza Six shopping complex opening in central Tokyo last year, Tokyo continues to offer new attractions. Meanwhile, extensions of bullet train services to the Hokuriku and Hokkaido regions have also helped bring more domestic visitors to the capital. Today, the most popular tour offered by Hato Bus is one that takes visitors onboard an open double-decker bus to scenic areas including Rainbow Bridge and the Kabuki theater in central Tokyo. A tour of industrial plants lit up at night is also popular, while other night tours are also drawing people as Japanese society moves toward reducing overtime work and enjoying nightlife under initiatives supported by the government. With the Olympics two years away, the company is planning to launch new tours related to the event. It currently offers some tours in English and Chinese.